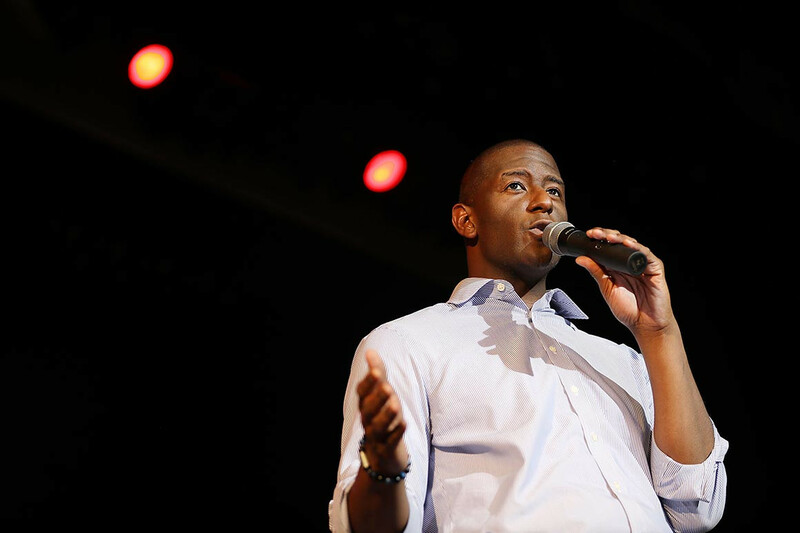 Even in defeat, Democrat Andrew Gillum is proving to be one of the winners of 2018. The former Tallahassee mayor is parlaying his razor-thin loss in the Florida governor’s race into a role in the 2020 presidential primary — as a kingmaker or perhaps even a candidate himself. With his stature enhanced by an exceedingly narrow loss in the nation’s largest swing state, Gillum has hit the Democratic speaking circuit across the nation, urging the party to stay the course on social justice and taking private meetings with top party officials — among them, former President Barack Obama. Last week, Gillum spoke at the Leadership Conference on Civil and Human Rights in Washington and later met with Obama. Days later, he spoke by phone to potential 2020 rival Beto O’Rourke and to former Massachusetts Gov. Deval Patrick, a one-time presidential prospect who praised Gillum. “He was a rock star yesterday, he’s a rock star today, and he will be a rock star in the future,” Tom Perez, chair of the Democratic National Committee, said Tuesday when he introduced the former mayor at a closed-door Democratic National Committee finance gathering in Washington, where Gillum got a standing ovation, according to two attendees. New York Democrat Alex Kirk said he was impressed with Gillum after hearing him for the first time. “Very charismatic, speaks from the heart,” Kirk said. Gillum came closer to victory than any Florida Democrat running for governor in the past two decades — losing by just 0.39 percentage points, or 32,463 votes out of more than 8.2 million cast — on the strength of a dynamic speaking style and progressive platform that was more liberal than any in the state’s modern history. Gillum would have been Florida’s first African-American governor if elected. At his closed-door speech Tuesday, attendees said, Gillum stuck to what was his standard 2018 campaign speech. He spoke about his biography (son of a bus driver and construction worker), the gains of Democrats in the last midterm (they won the U.S. House and flipped two Florida congressional seats blue) and voter disenfranchisement, a trenchant issue in Florida after 65 percent of voters opted to automatically restore the voting rights of non-violent former felons. One topic he avoided: the 2020 presidential election. For the first time since graduating from Florida Agricultural and Mechanical University, after which he was elected Tallahassee city commissioner and then mayor, the 39-year-old Gillum won’t hold public office. But in the spring, he’ll head back to school to teach a weekly class at the Institute of Politics at Harvard University. Aides and supporters say Gillum is not completely sure about his next steps, but he may head up a political group or movement that focuses on voting rights. His spokeswoman, Kirsten Allen, said he wants to stay true to his campaign and to Florida, the nation’s largest swing state. Another possible role Democrats are whispering about: vice presidential candidate. Fueling the speculation is his busy travel schedule since the end of the gubernatorial campaign. Two weeks ago, Gillum was honored at the Ebony 100 gala in Los Angeles and taped the Van Jones show there. On Monday, Gillum gave a “thank you” address to 200 campaign volunteers in Miami and plans to meet with more Tuesday in Tampa and Wednesday in Jacksonville. Previous Previous post: A Professor Challenged His Class To Go Viral For An Assignment. Students Then Tricked Millions Of People.